Do pets help children who have sensory issues or who suffer from anxiety cope with everyday life experiences? 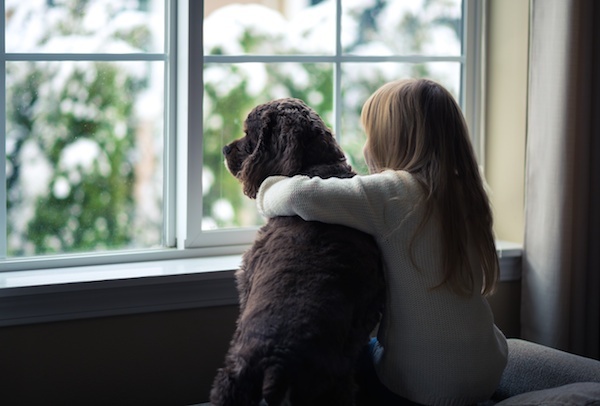 If you have a child with additional needs related to ADHD, processing disorders, learning disabilities or behavioral issues, you may have noticed that he or she is calmer and more connected around domestic animals. A family-friendly pet may be beneficial to a child who struggles with sensory, social or behavioral issues. Interaction: Children tend to interact verbally and socially for longer periods, enjoy themselves more, and are more aware of their surroundings when playing with pets rather than with inanimate objects. Empathy: Bonding with a pet is thought to encourage empathy towards other humans and animals. Positive Mood: Interaction with a pet tends to improve mood and promote positive emotions. Anti-stress: A link exists between pet ownership and anxiety reduction. The presence of a pet can reduce the amounts of cortisol, a stress-response hormone produced by an autistic child upon waking in the morning. The amount of cortisol in a waking autistic child decreased from 58 percent to 10 percent when a service dog was present. When the dog was taken away for a short while, the amount of cortisol increased to 48 percent. Blood Pressure and Heart Rate: Children involved in animal-assisted therapy (AAT) had lower blood pressure and heart rates when interacting with and stroking a dog, implying that the activity is relaxing. Learning: Although it's not known if the brain benefits directly from owning a pet, pet ownership does seem to assist in learning. The presence of a pet improves motivation and speed when completing tasks, and increases listening skills and concentration. What Type of Pet is Right for My Child? Before you rush out and get a pet, consider a few things. Lifestyle: If you live in a small apartment or don't have ready access to open spaces suitable for exercising a dog, choose a pet that doesn't need a lot of exercise, such as a rabbit, hamster or guinea pig. Cleaning: All pets, particularly those kept in runs or cages, need clean environments. Waste products must be removed daily and bedding replaced regularly. Feeding: Pets need food and water every day, so take the cost of the appropriate foods into consideration. Attention and Loving Care: Does your child have the time to play with and train a pet? Commitment: Day-to-day commitment is needed, and if your child has a pet like a dog or a cat, this responsibility may last 10 to 12 or more years. Noise: Children with sensory processing disorder or anxiety may not like the pitch of a dog's bark or may be extra sensitive to other pet related noises like squawking from a bird. If you choose to get a pet for your child, make sure the timing is right and that he or she has an actual interest in animals. The right family-friendly pet may be just what your child needs to better cope with daily stressors and other overwhelming sources of stimulation. Owning a pet may help ease these daily anxieties and help to better facilitate socialization and understanding.